Breakout activities specifically designed for Pre-K and kindergarten! 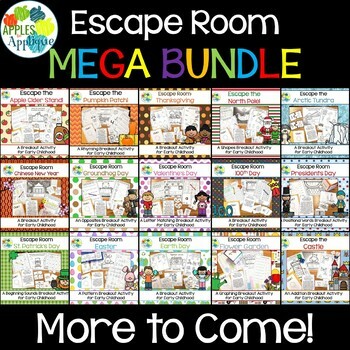 These escape rooms are age appropriate for early childhood, keeping the same fun collaboration and problem-solving elements we love about breakout games, while adapting to the needs and abilities of the littlest learners. Each escape room focuses on a specific skill, such as shapes or rhyming. Four different activities are included in each escape room to get kids up and moving while they learn. Flexible game play! Tips included for using as a whole group, with small groups, or even individual students. Also includes options for differentiation. Play in one session, or break it up over several days. Easy setup with clear instructions. All you need to provide are 5 manila envelopes, and some occasional classroom supplies like a pocket chart or dice—no fancy locks or boxes required! The teacher reads the first story card to students and shows a picture to set the scene. A question is presented; students need to earn letters to spell the answer to the question. Students look for the envelope marked Clue 1. Inside the envelope is the first puzzle and the next story card. The story cards move the plot along and keep the students engaged. After the first puzzle is completed, students earn one letter to put on the code sheet. This same format is followed for Clues 2-4. After the fourth puzzle, the word on the code sheet is completed, and the students win the game! You may also be interested in these great resources!